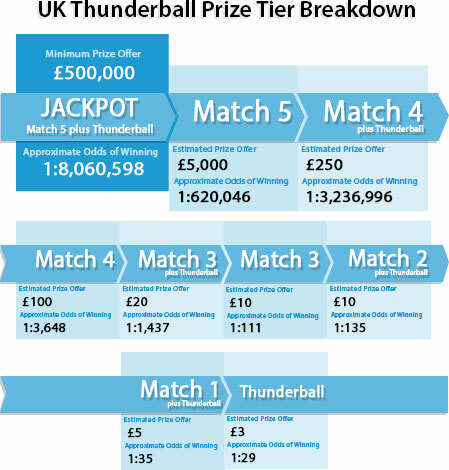 To win 1the jackpot prize of £500,000 in UK Thunderball lottery, you must match the 5 main numbers and 1 Thunderball. Draw happens four times a week, every Tuesday, Wednesday, Friday and Saturday and are televised live on BBC One. The very first Thunderball draw was held on 12 June 1999 where the draw was originally held on Saturdays. Also, during those times the jackpot prize was only half of the current top prize, which is £250,000. However, the rules significantly changed starting 9 May 2010, now giving away £500,000 top prize and also awarding a prize for matching the Thunderball alone. After this date, the Friday draw was introduced in addition to Wednesday and Saturday draws. Choose 5 main numbers from 1 to 39 and 1 Thunderball from 1-14 or use “Lucky Pick” to play with random generated numbers. Add another line if you wish. You can play from 1 line up to 30 lines per ticket. Play additional tickets if you want to add more. Choose your draw days - Tuesday, Wednesday, Friday or Saturday draw. Or you could also play for all draw days. Choose your weeks. You can play for the upcoming draw or you could also select to play for multiple future draws. Review your selection carefully then click “Check Out” button to submit your form. We will now process your ticket. After placing your order with us, you will receive your OneLotto official ticket(s), which can then be viewed within your “My Account“ page. Once each draw has taken place and the prize breakdown has been announced, OneLotto will publish and upload the results onto our website. We will also send out a full result email to all participating players. OneLotto system will automatically check your ticket for any winning matching combinations against your play ticket and will systematically load any prize winnings onto your OneLotto “My Wallet”. Winning ticket holders will receive a notification email from us. Thereafter, you may withdraw your winnings using your “My Account” page. Winnings above £50,000 will take approximately a week for us to collect from the National Lottery operator on your behalf and thereafter remit to you as per your instructions. All the prizes in UK Thunderball including the jackpot prize of £500,000 are fixed so to get idea on what you can expect when you play Thunderball, please refer to the table below. You will also see the approximate odds of winning for each prize tier. Due to the fixed prize nature of the lottery, there is no roll over of any Prize Monies in case the jackpot prize is not won. However, in few limited circumstances, prize capping takes place and this is only if the total value of prizes available is more than four times the total value of entries for that Thunderball draw. And if this prize capping takes place, there will be calculation made to identify which prize categories will be affected. please refer to this link.